To join, make sure you’re a Frequent Steeper (if not, sign up below). Then simply purchase a qualifying item from a wide selection of fabulous teaware. That’s it, you’re in! Enjoy 20% off as many 100 g loose leaf purchases as you wish until September 3rd. Just buy any qualifying item and you'll start saving on tea right away. Could summer get any sweeter? Offer valid until September 3rd, 2018. Must be a Frequent Steeper to be eligible. 20% tea discount applies to bulk tea purchases of 100 g or more per tea, and only on loose leaf tea from our tea wall and Mega Iced Tea Tins. While supplies last, quantities are limited. Only valid on purchase of Iced Tea Presses, Tea Presses, Pitcher Presses, Perfect Pitchers, Matcha Makers, Steepers, Stainless Steel Bottles, Iced tea travel kit or Iced Tea Steeper Kit made on or after April 10th, 2018. 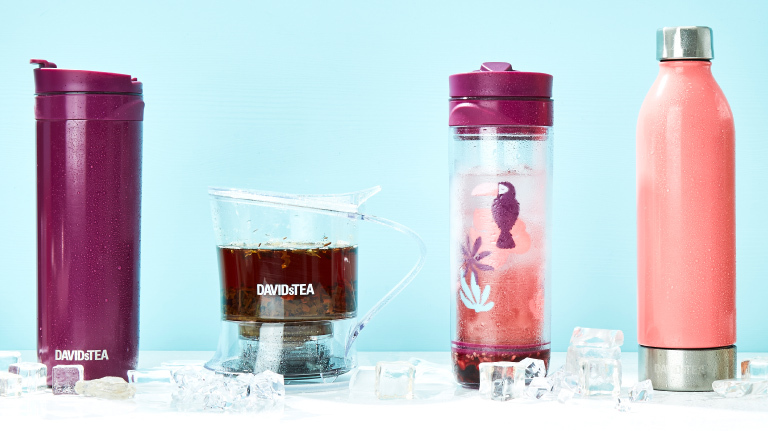 This offer is subject to change, alteration or termination by DAVIDsTEA at its sole discretion at any time and without notice. Cannot be combined with Frequent Steeper free tea redemptions. Cannot be combined with other offers. Club membership is non-transferrable.